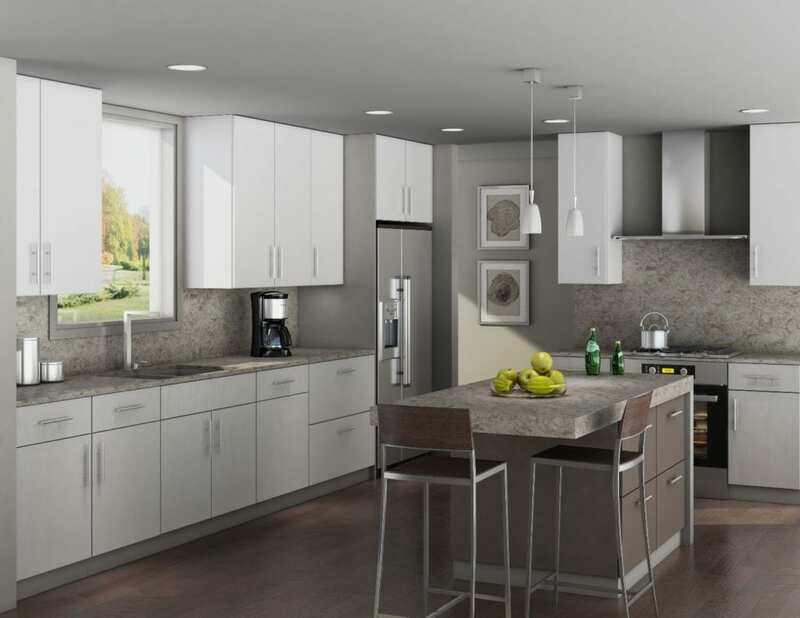 Flat, simple cabinetry is a hallmark of contemporary kitchen design. That means cabinet doors where little or none of the door frame shows, creating an almost seamless appearance. The most popular styles for cabinet doors are slab front (flat with no decorative details) or Shaker-style with subtle, simple lines. Cabinet hardware is often omitted to further the minimalist look and feel. 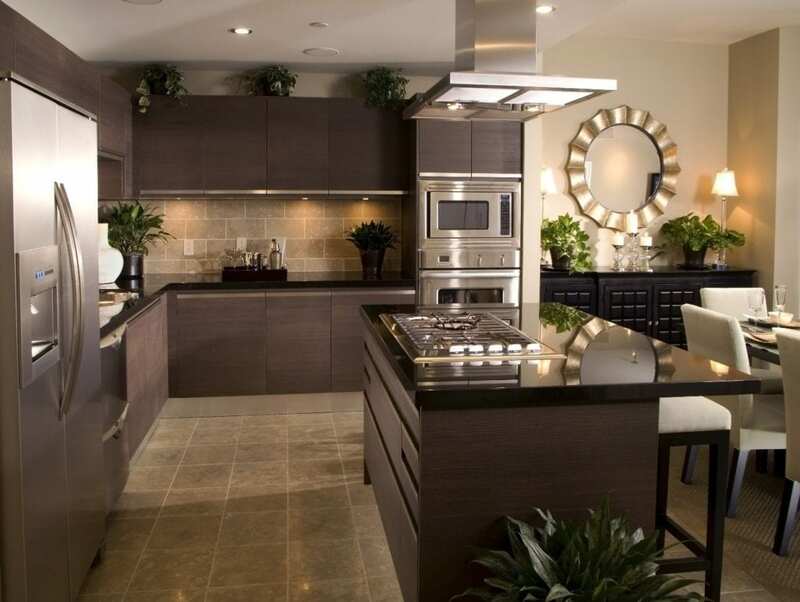 This contemporary kitchen uses dark, slab front cabinetry along with sleek, flat drawers on the center island. 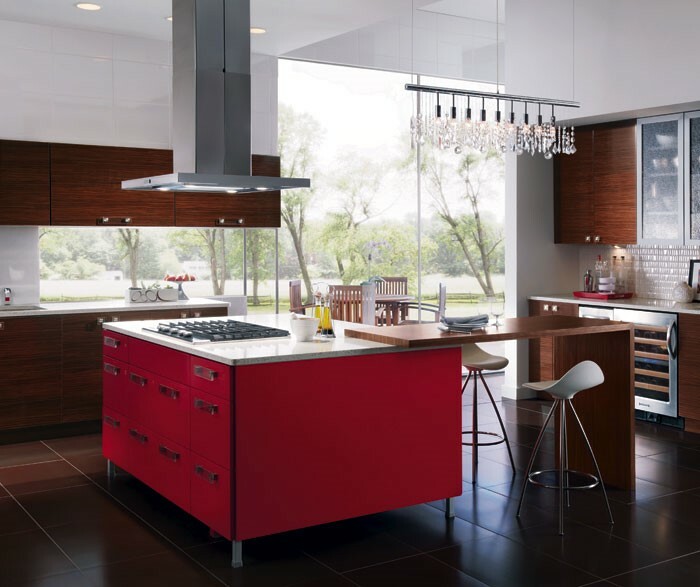 Straight, linear lines and clean, well-defined edges are another essential element in contemporary kitchen design. Basically, you want all of the horizontal lines that define the space to line up perfectly. 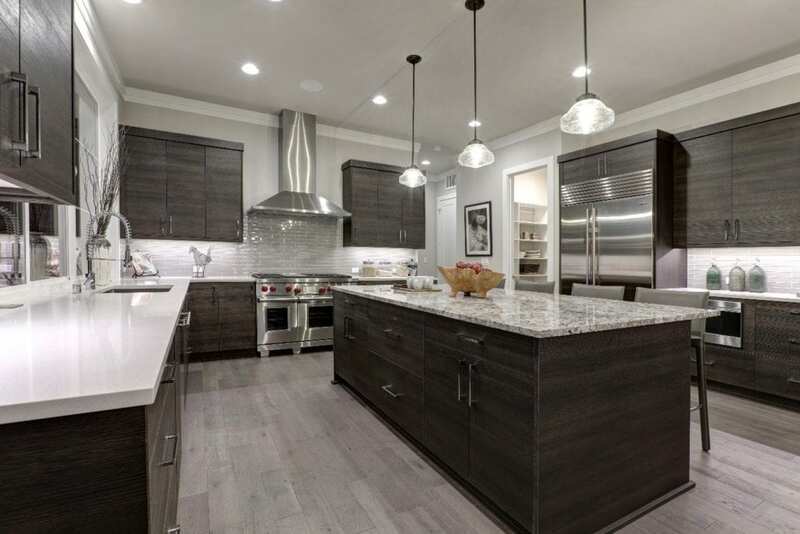 This contemporary kitchen is a perfect example with straight, clean lines from the cabinetry and kitchen island to the lines in the tile backsplash and wood flooring, providing a sleek, sophisticated look and feel. Vertical grain patterns in the lower cabinetry also add to the design. Contemporary kitchen design is also defined by modern, industrial elements including stainless steel appliances and other metal accents. Notice how the bright, industrial appliances and sleek, futuristic style of the metal range hood in this example stand out against the dark, flat-style cabinetry, adding a sense of modern sophistication. Some kitchen designs even include metal seating around the kitchen island to push the look even further. While contemporary designs can feel stark in their simplicity, a growing number of homeowners are adding natural materials to create a sense of warmth, texture, and connection with nature. Natural materials most often include wood, glass, or natural stone. Notice how this kitchen combines a natural stone countertop on the kitchen island with the rich wood grain in the cabinetry. The wood floor and glass pendant lights add even more texture and interest, while keeping the space sleek and modern. While simplicity is the name of the game when it comes to contemporary design, many modern kitchens also include geometric shapes that complement linear lines, creating interesting accents or focal points. This kitchen adds interest and a bit of drama with rectangular lighting fixtures suspended from the ceiling. The ball-shaped, glass pendant light and circular ceiling lights also add dimension and design depth. While many contemporary kitchen designs omit door and drawer hardware for a sleek, seamless appearance, hardware still has its place. Just be sure any hardware you choose is simple and sleek, never ornate. 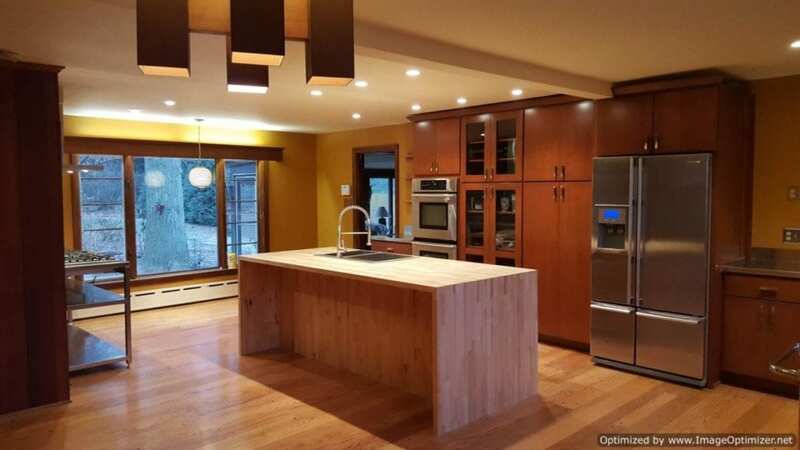 Bar hardware, like that pictured in this contemporary kitchen, is the most popular choice. 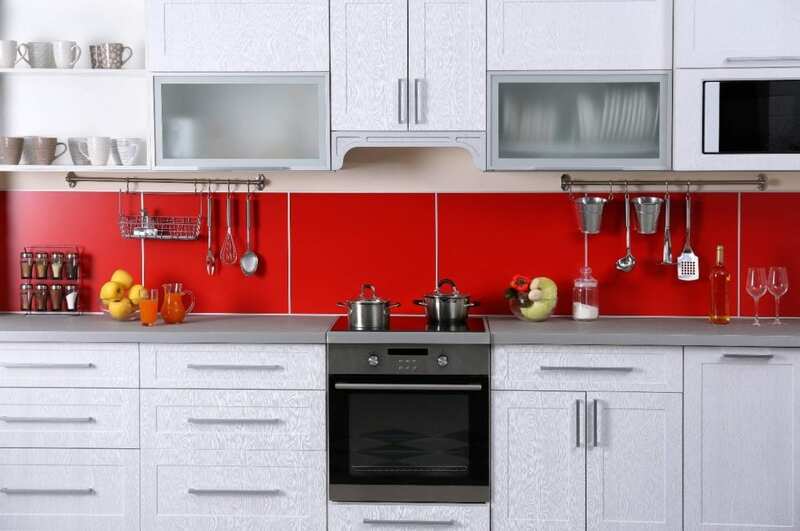 Popular hardware finishes include brushed nickel, stainless steel, or chrome. While most contemporary kitchen designs use stark whites or a neutral color palette, there’s plenty of room to spice things up, while keeping the design clean, sleek, and modern. One of the best ways to add a bit of flair to contemporary designs is adding small pops of color. A red backsplash in this otherwise stark, white kitchen adds unexpected excitement, while still maintaining a clean, orderly design. If an accent wall is too dramatic for your tastes, you can also add pops of color with a fruit bowl or planter, decorative seating, or modern-style curtains. Now that you know more about the elements in contemporary kitchen design, we hope you’re inspired to work some magic in your own kitchen. 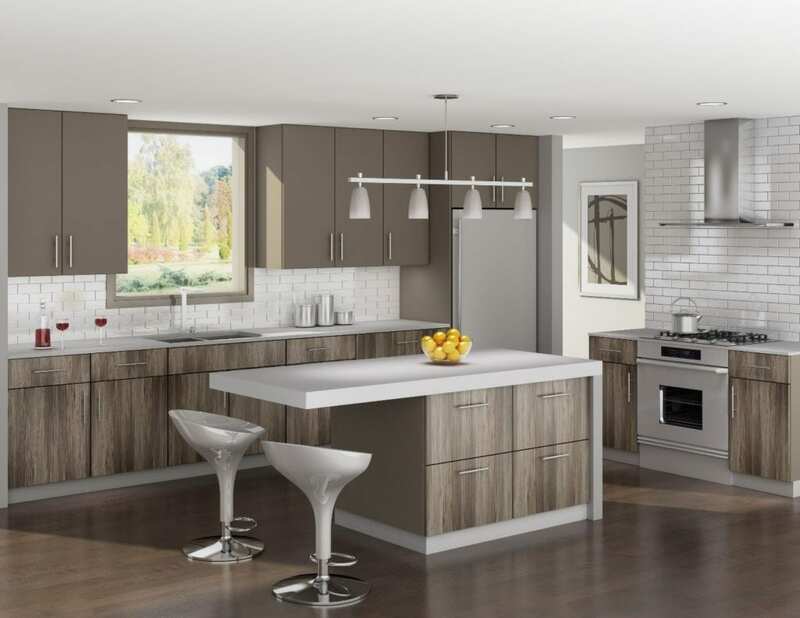 If you’re planning a kitchen remodel in the near future, Red Rose Cabinetry is here to help with beautifully crafted cabinetry and a ton of creative ideas to transform your kitchen into the gorgeous, functional space you’ve always dreamed it could be. Stop by our showroom, located in Lititz, PA to explore the possibilities!